“We gotta go,” I mouthed to Hugo, who nodded at me while pounding out rhythm and blues on the school piano, playing back up for a couple of guitarists. It was an odd Valentine’s Day. Jules was in Florida and Max was having dinner with his 90-year-old godfather, whose younger brother had died earlier that week. That left just Hugo and me, along with the babies. Rather than cook, we went to the Waldorf school for a potluck and open mic. Leif, who had uncharacteristically clung to me since we’d arrived an hour earlier, softly chanted I want to go home for several minutes before I reluctantly pulled Hugo off the piano. Once home, I changed Leif into his pajamas. His torso was warm, too warm. I tilted him back in my arms and felt his forehead. Hot. “You don’t feel good, do you?” I asked him and the eyes looking back at me were glassy. The next day, Lyra, who turned six month’s old on Valentine’s Day, had her latest check up with Dr. M, her pediatrician. Just shy of twelve pounds, Lyra remains in the less than 4th percentile for typical children, but around the 40th percentile for children with Down syndrome. The biggest “problem” with her size is clothing. Those sized 0-3 months clothes are generally for children weighing 8-12 pounds. Some of her clothes this size, especially those with footies, are getting small, but clothes sized 3-6 months are voluminously large on her. The few things that fit well get washed often. At Lyra’s appointment, I negotiated the supplementing of iron with Dr. M, which she strongly advocates because anemia can lower a child’s IQ (it has to do with oxygenation of the brain). Unfortunately, iron can also cause constipation, which happened with Lyra as soon as we gave it to her. In order to avoid a potential problem, I feel we have created a real one. Constipation is a commonly associated with Down syndrome and something Lyra did not have until we introduced iron to her system. I have taken her off of the vitamins and pointed out to Dr. M that the cereal we give her (Happy Bellies brand) also contains iron. “Why don’t you try adding some extra fiber to her cereal to get her going again,” said Dr. M and she wrote down a brand name on the “Babies at Six Months” handout. She then said, “Before you go, do you want me to look in Leif’s ears and throat?” Leif was still hot. Some people are sweet when they don’t feel well (Claude and Jules) whereas others are crabby (Hugo, Leif and, to be frank, me). During our appointment, Leif had thrown himself on the ground several times, tried to run out of the room when the nurse came in, pushed the stool to the wall so he could reach the light switch. Thank heavens Dr. M blocks out extra time for visits with children with DS. “His ears look fine, his nose is clear and I don’t see anything in his throat,” she told me after I wrestled him down for her. Other than a fever and an attitude, Leif was fine. That was Friday. Two days later, we were at Akron Children’s Hospital’s Emergency Room. By Sunday evening, Leif’s head had become a ramped up mucus factory that poured its products not only from his nose, but also from both his bloodshot eyes. His eyes were slits in his puffy face and he looked like he’d been stung by a swarm of bees. When we put him to bed, he had slept briefly before waking up, screaming in pain. But most concerning, and why we ultimately made the call to go to the ER, was he had refused to eat or drink for much of the day and his lips were cracked and bloodied from dehydration. Leif was diagnosed with rapid onset, bilateral, acute conjunctivitis and bilateral, acute otitis media or in lay terms: a bad case of pink eye in both eyes and equally bad ear infections in both ears. They put him on Augmentin and because he’s never been on antibiotics before (and Augmentin is really strong), Leif’s eyes cleared up within 24 hours. What’s This Got to Do with Lyra? I wear contacts, I’ve had pink eye. You can’t wear contacts when you have pink eye. For me, that’s no biggie, I just wear glasses for a while. But if Lyra gets pink eye and cannot wear her contacts, she effectively cannot see. Recently, my own eye doctor, who also fits contacts on children who have had lensectomies, showed me what Lyra can see without her lenses. In an open container the size of a shirt box, the doctor keeps glass lenses lined upright in several rows, like poker chips. He handed me one of these diagnostic monocles by the tab in its wire frame and told me look through it with one eye closed. It was like looking through glass block. I could see light and color about as well as before, but shape and distance were impossible to comprehend. Were that my vision, I wouldn’t be able to walk safely down an open hallway. When Lyra is older, she could wear glasses if she needed to. For her condition, however, it would require lenses that are extremely thick and made of glass, not the lightweight polycarbonate most eyeglass lenses are made of today. Right now, she’s too little for the glasses she’d need and taking a break from her contacts would potentially affect her brain’s vision development. In order to literally grow the part of the brain that processes vision, the brain needs the eyes to see, and see well. As I described in the post “I See You and You See Me,” this is why Lyra had her lensectomies at such a young age (six and seven weeks old). Lyra’s surgeries were dramatic, so it’s no wonder people often ask for updates on her eyes. The good news is that there is not much to report. Her eyes healed from surgery without any complications. She wears extended wear contacts that are aphakic. Aphakia simply means an eye without a (natural) lens. Eyes have lenses that, when working perfectly in pairs, provide 20/20 vision. Thus, aphakic contact lenses (or glasses) are not corrective lenses, but rather replace the surgically removed lenses. Many people, particularly as they get older, don’t have perfect lenses and need either glasses or contact lenses to correct their vision. Less common, and not universally recommended, is refractive surgery in which a corrective lens is surgically implanted over the natural lens to correct nearsightedness. Lyra’s aphakic contacts do not look like my contacts. It is easy to see them in her eyes—the edges often look like a piece of Saran Wrap that isn’t fully adhering to her eyeball. Also, her pupils are clearly magnified, which makes them look huge, like manga pupils. I asked Lyra’s surgeon about the way her contacts look a week after her second surgery. Something I love about her surgeon is that he clearly gets geeked up when I ask him to explain how what he does works. “It’s about a four,” I said. “Lyra’s is a 20. And that’s why they are shaped this way,” he said as he showed me the lens he was about to place in Lyra’s left eye. On the tip of the surgeon’s forefinger the contact rested as it would in her eye. He held it up so I could see it in profile. My contact lenses when viewed from the side look like the arc of the sun just before it sets on the horizon. Lyra’s look like a UFO because the center of the lens pops up, like the control room where the aliens sit when they fly their saucer ships. That’s where all the magnification is and why her pupils look so big. The pupil on Lyra’s right eye is not round but elongated at the top, looking a little like a cat’s eye. A small portion of her iris, just above her pupil, was unintentionally removed in her lensectomy. When I pointed it out to the doctor, he said it happens and her blue eyes made it more noticeable. He didn’t seem concerned, but I was and wanted to know if it would affect her vision. Early on, the surgeon told us he’d keep Lyra in contacts as long as she’d tolerate them, forever even. I thought by “tolerate” he meant something medical, but he didn’t. It became clear to me what he did mean when I spoke with another mom in the waiting room just before Lyra’s contacts were cleaned for the first time. This woman’s daughter, who does not have Ds, was born with a cataract in one eye. “After my daughter’s surgery,” she told me, “she wore a contact, but I couldn’t get the thing in or out, you know? And it popped out all the time! I mean she would just scream and I couldn’t hold her still, so they gave her the glasses, but she kept pulling them off. Finally they agreed to do the surgery. But now I don’t think she’s seeing in that eye and that’s why we came in.” A pretty child of about three, she wanted to see my baby. Seated with Lyra in my lap, I looked into the girl’s big, brown eyes when she came over to us. Her left eye looked blind. 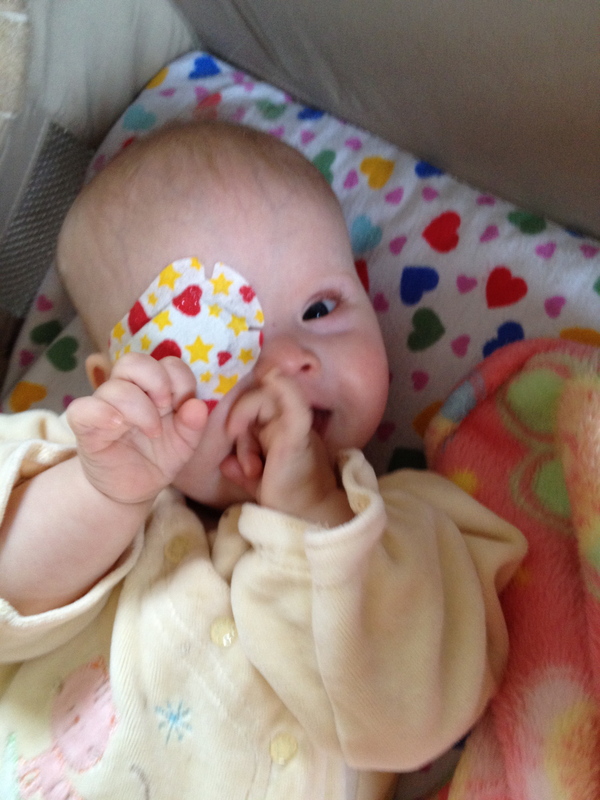 “That’s because her mother has a hard time getting her to wear a patch on her good eye,” said the surgeon. In the exam room, I told him how upset, no, completely freaked out I was at the idea that after the surgeries our Lyra could still be blind. “Things are ironically easier for your daughter because she had bi-lateral cataracts. She doesn’t have a dominant eye.” As for the difficulty that mom had changing her daughter’s contact lenses, the surgeon told me that because of Lyra’s Ds her eyelids were very different, making it harder to insert and remove the contact lenses. Therefore, he told me, they will be conducting the cleanings in his office for the foreseeable future. 1) A nurse’s aide comes into the exam room and has me lie Lyra down on my lap with her bottom against my tummy and her head near my knees. After thoroughly washing her hands, she tries to hold Lyra’s eye open with one hand so that she can place a small suction cup (designed to adhere to contact lenses) on Lyra’s contact. As soon as the aide tries this, Lyra clamps her eyes shut and screams like she’s been cut with a scalpel. 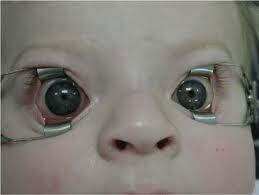 A baby’s eyes opened with optical specula. This is not Lyra, but it is how she looks as she lies in my lap while I hold her down. It’s no wonder she fights. 2) The aide leaves the room and comes back with a nurse. The nurse pulls an optical speculum out of a drawer and, after two or three attempts, manages to get it properly in Lyra’s eye. This is never a pretty site. With her eyelids forced open, the aide again tries to suction out the contact. It still doesn’t work, so she instead tries to use a long cotton swab to push the lens off of the center of Lyra’s eye. Once, this made the eye bleed. All the while, Lyra is screaming and sweating as I continue to hold her arms to her sides and the nurse firmly holds her head. 3) After several attempts, the aide again leaves and brings back the surgical fellow, a woman from India, who attended both of Lyra’s surgeries. Using a different speculum, the surgical fellow quickly removes both contacts. As soon as the second lens is out, I pull Lyra up and hold her on my chest to calm her down. 4) Putting the cleaned contacts back in is almost as difficult as getting them out and only achieved, again, by the surgical fellow. “It wasn’t that bad,” said Max when he called me after the appointment. “The surgical fellow was in surgery, so they sent in the nurse’s aide and she got the first lens out on the second try.” Unbelievable. I certainly want this to be as easy and painless as possible for Lyra, but it seemed unfair that it had been such an ordeal when I had taken her. Perhaps the team had gotten their technique down. Perhaps Lyra has become better accustomed to having her eyes messed with. But I’m afraid she did worse with me because she felt my emotional distress at holding her down against her very strong will. Lyra looking unusually happy during a morning eye patch hour. I don’t know if it is the increased strength of her new lenses or the fact that we are now several months past her surgeries and her brain has had time to catch up to the visual input, but the way Lyra sees has changed recently. Maybe it’s the new lenses working together with the more developed brain. Whatever the underlying causes, it is as though Lyra has awakened. She quickly turns towards the direction of sudden sounds. She recognizes people and rewards them with full-faced smiles. Pink eye is extremely contagious. And even though antibiotics might have rendered him non-contagious, the fact that Leif cannot keep his hands off of Lyra makes me anxious. Five days after Leif began taking Augmentin, I took Lyra to her surgeon’s office to make sure she didn’t have conjunctivitis. I had lost all objectivity and her eyes looked symptomatic to me. We saw a different surgeon in the practice and he told me Lyra’s eyes were clear, but gave me his cell phone number with instructions to call if anything changed. That same afternoon, my eye doctor told me I had a mild case of bacterial conjunctivitis. Mild enough that he would not have prescribed antibiotics except that I live with Lyra. The next morning, the same doctor told Max that he had a pretty bad case of it. That’s three out of six of us currently living in the house. My hands snag our clothes when I fold laundry because they are so dry from how much I wash them these days. I love winter. I love the snow and the deep freshness of cold air. I love being cozy in a warm house with a fire in the fireplace or pies baking in the oven. But I want this winter to end. I cannot remember a cold and flu season that has come close to affecting us as much as this one has, where all of us have been sick more than once. Leif is still not 100% himself and it’s been two weeks since he first came down with a fever. The next day the mercury is over 50 degrees Fahrenheit, you can be sure the windows of our house will be wide open. Meanwhile, we wash everything we can and often. Linens, hands, surfaces, faces. Knock on wood, so far it’s working and Lyra remains clear eyed. This entry was posted in Lyra's Latests, Uncategorized. Bookmark the permalink. Very interesting. I hope things continue to go more and more smoothly each time for you and for Lyra. It appears you’re doing a great job with a complex process. We’ve been lucky to avoid sickness this winter, but I am looking forward to the Spring. I hope your little guy is feeling better.